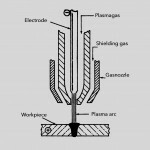 Plasma is a further developement of TIG welding, with the arc surrounded by a concentrated stream of gas supplied at pressure through a central nozzle. Thereby the gas, usually argon, is ionized to create a plasma arc column with high energy and temperature. An extra shielding gas is supplied through an external nozzle to protect the arc and molten metal. 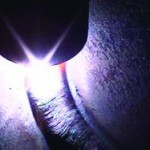 Plasma welding is suitable for most metallic materials, and is characterised by an almost cylindrical arc column giving full penetration in an I-joint up to 10-12 mm thickness. This arc is creating a so called “keyhole”, which is subsequently closed as the arc moves forward. 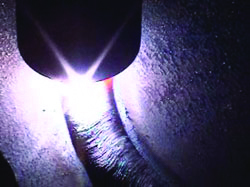 Modern plasma welding units also have a control mechanism taking care of keyhole closing at the end of the joint, making the process very suitable for girth welds on pipe. is mainly employed for mechanized welding units, it works with or without filler wire and provides minimum defects at maximum economy. Equiment is available for a wide range of material thickness, using welding currents from 1 amp (micro-plasma) to 500 amps.